For Alaska's inaugural Hempfest that Niki Raapana organized several years ago, she remembers public outcry was so intense that sponsors and planned venues repeatedly dropped the event after people complained. That continued last year, she says, when four different venues abruptly cancelled on her. Rumors spread that Hempfest would not be happening, though in the end she finally secured a spot at a venue in Wasilla, the state’s sixth most populous city. “There's a lot of hostility still around hemp and cannabis” in the state, Raapana tells ConsumerAffairs. The general public in Alaska may not be embracing hemp, but the state’s conservative politicians are. Last month, the Alaska Legislature unanimously put their support behind hemp, passing a bill that would allow farmers to participate in a pilot program to grow hemp -- a cannabis plant that looks like marijuana but has negligible levels of THC, its psychoactive component. The bill was sponsored by Republican state Sen. Shelley Hughes, who said that the push to legalize hemp came from farmers. It is now awaiting Governor Bill Walker’s signature. One resident in Homer, Alaska is reportedly insulating his home with hemp, a move he said is cutting down on energy costs. But because hemp is not yet legal to grow in the state, he must have it imported. Assuming Alaska’s governor signs the bill into law, it will become the 35th state that has legalized the growth of industrial hemp in just the past several years. Currently, most hemp is imported to the United States due to federal drug laws that lumped all cannabis crops in with marijuana. Imported hemp is estimated to be a $500 million industry here, but the product was not grown domestically in recent years until Colorado launched a pilot program in 2013. The 2014 Farm Bill signed into law by former President Barack Obama redefined hemp as a crop distinct from marijuana, with a carefully-written provision that gave states the authority to legalize hemp themselves. Rural states and farming communities are now seizing on the measure, hoping that hemp will revitalize farming communities with struggling economies. 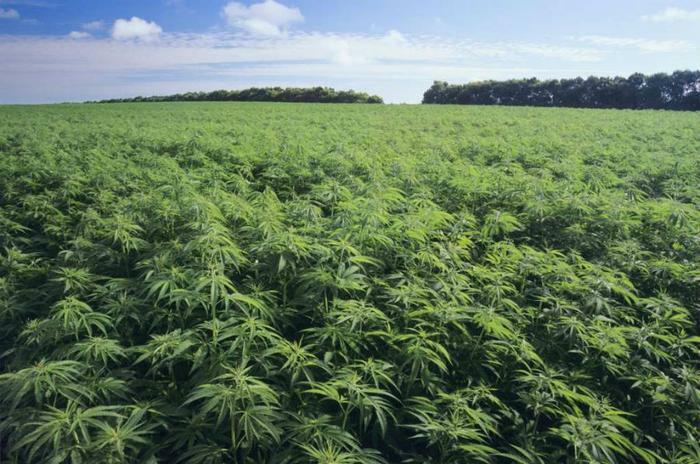 “The Kansas Farmers profits per acre could improve by as much as 30 fold which will fix many Kansas issues,” says the Facebook page of Kansas for Hemp, which adds that they would not be endorsing the measure if it had anything to do with the legalization of marijuana. Alaska legalized weed in a voter initiative in 2015, but Raapana says people didn’t realize at the time that hemp remained illegal. Last year, police raided several Alaska dispensaries -- not for selling marijuana, but for selling CBD oil, which is thought to have medicinal properties but does not get users high. The product is derived from hemp, so it had to be imported, which police argued was a violation of state marijuana laws mandating seed-to-sale tracking. Alaska’s Marijuana Control Board ruled shortly afterward that CBD was the same as marijuana, despite dispensaries and patients arguing to the contrary. But the hemp bill that Alaska lawmakers recently passed would change that, redefining CBD as a product that is not marijuana and allowing dispensaries to sell it once again. Raapana was originally interested in hemp because she wanted to use it to design yurts, or the insulated tents historically used by Mongolian nomads that are now a popular camping option for people planning long-term stays in extreme weather. At Seattle's Hempfest, where she got the idea to host an Alaskan offshoot of the event, she learned what farmers, politicians, and the rest of mainstream United States is slowly catching up on: that hemp has a dizzying variety of uses and the potential to make its growers millions. “There is no doubt Alaska’s hemp industry will start out small, but it has the potential to become a vibrant contributor to Alaska’s economy,” wrote the editorial board of the Daily News-Miner, just one of many local newspapers that gave favorable endorsements to legalizing hemp. The 2014 Farm Bill officially re-opened the floodgates for today’s hemp industry interests, but limitations remain. Under the federal legislation, hemp can be grown if a university or one of the state Departments of Agriculture uses it “for agricultural research purposes where permitted under state law.” In other words, the Farm Bill gave states the authority to legalize hemp, but it must be used for some sort of research purpose. “The law also requires that the grow sites be certified by—and registered with—their state,” writes the National Conference of State Legislatures. Many state lawmakers are interpreting those rules to mean that private farmers can still use hemp as a revenue-generator, as long as there is also some public research component to its legalization. Kentucky, for instance, now allows farmers to sell fiber, hemp seed oil, and other products that they cultivated, provided they obtain a permit. At the same time, Kentucky also piloted a research program into the environmental benefits of hemp and the potential to use it as a biofuel. In North Carolina, which the hemp industry describes as the epicenter of the industrial hemp boom (one farmer described the crop as “Carolina Gold”), the state established its own hemp commission to collaborate with universities on research into soil conservation and restoration on land where hemp is grown. North Dakota is stricter than many other states. Currently, only 35 farmers are permitted to grow industrial hemp due to concerns that production could outpace demand. State legislation also allows North Dakota State University to study hemp. Farmers have planted an estimated 3,000 acres so far but are banned from deriving CBD oil from the plant. “We’re limited to seed and fiber, and there’s not much of a fiber market,” one North Dakota farmer told Marijuana Business Daily. Not all states agree that growing hemp is safe under federal laws. Indiana's conservative lawmakers unanimously passed legislation last month that would have legalized the possession, transportation, sale, and growth of industrial hemp products, including CBD oil. But the state’s governor recently directed the legislature to rework the bill over concerns about complying with federal laws. “I want to make sure the regulatory environment community, that we have the personnel in place. We don’t right now,” the governor told the local news. In Alaska, meanwhile, the pending legislation would officially re-define as hemp as an agricultural product and establish a hemp registry in the Alaska Division of Agriculture. One day, advocates like Raapana envision hemp as a biofuel source, but with strict regulations still governing its growth, she doesn’t see that happening in the near future.